Quad Cities Global Growth Initiative economic asset and opportunities analysis | Vandewalle & Associates, Inc. The Quad Cities and surrounding region, as much of the greater Midwest, will face continuing challenges over the next decades: globalization, loss of traditional industries, and the need for skilled workforce replacement. 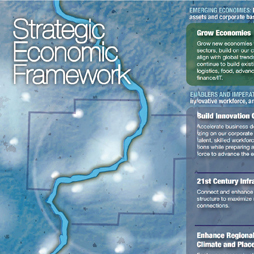 Funded by regional corporate anchors Deere & Company and Alcoa, the Quad Cities Region Global Growth Initiative is an innovation and technology focused economic initiative. The initiative set out to align many of the individual economic development efforts within the broader Quad Cities Region economic region toward a future-based, innovation-driven vision of how the Region can compete and succeed in a global innovation economy. Define the Region’s assets in the context of global trends. Identify emerging economic opportunities and an economic framework based on existing assets and global trends. Engage regional thought-leaders including project management, resource and steering groups. Inform and integrate into various regional strategic plans to build alignment and momentum.